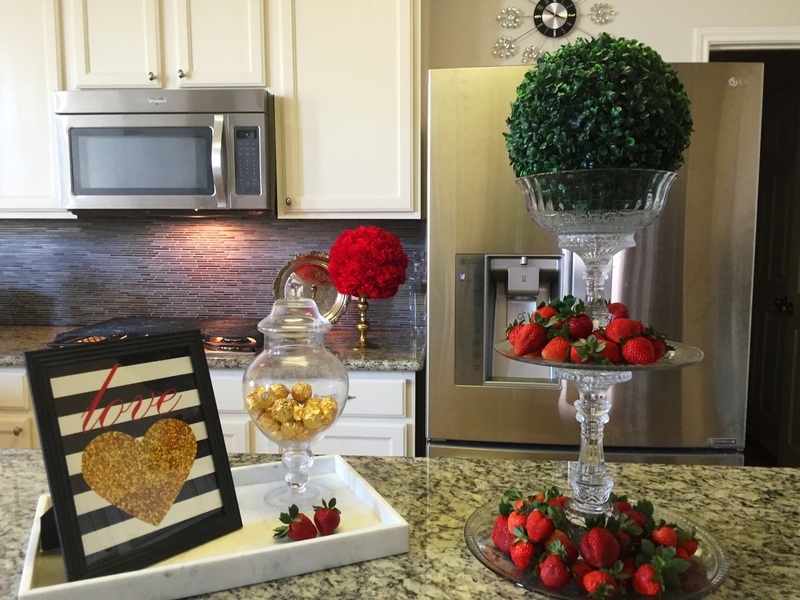 I wanted to come through and share a few things that I’ve done just to add a little Valentine’s Day flavor to my home. I’ve never been one to decorate for Valentine’s Day, but I thought it would be fun to see just how many different settings I could create using items I already owned. I wish I could say I created all of these settings for free, but I did have to break down and purchase a few items. I was exited to re-purpose some DIYs I created last year. Especially those I thought would come in handy once. 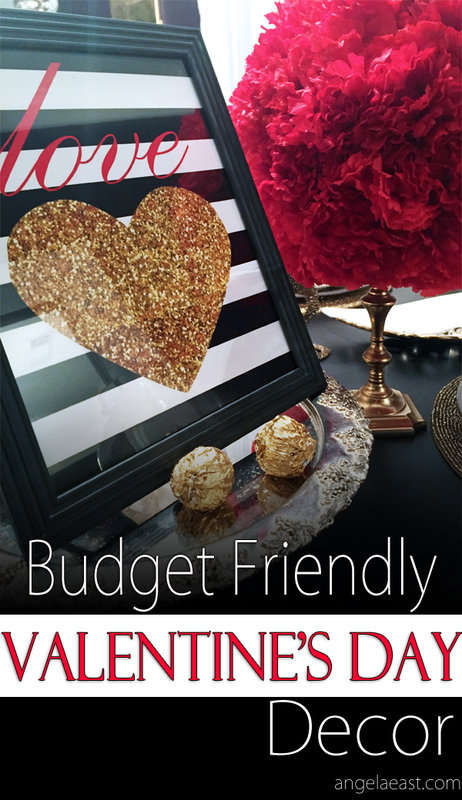 This post has a few fun projects you can create yourself plus a free printable for you to use in your Valentine’s Day Decor. Be sure to check see the bottom of the post for the goodies. Enjoy and I’ll see you at the end of the post. In almost all of my photos, if not all, I used strawberries. I think they are so sensual and perfect for the Valentine’s day feeling of love. I also stuck with the color scheme Red, Gold, Black, White. 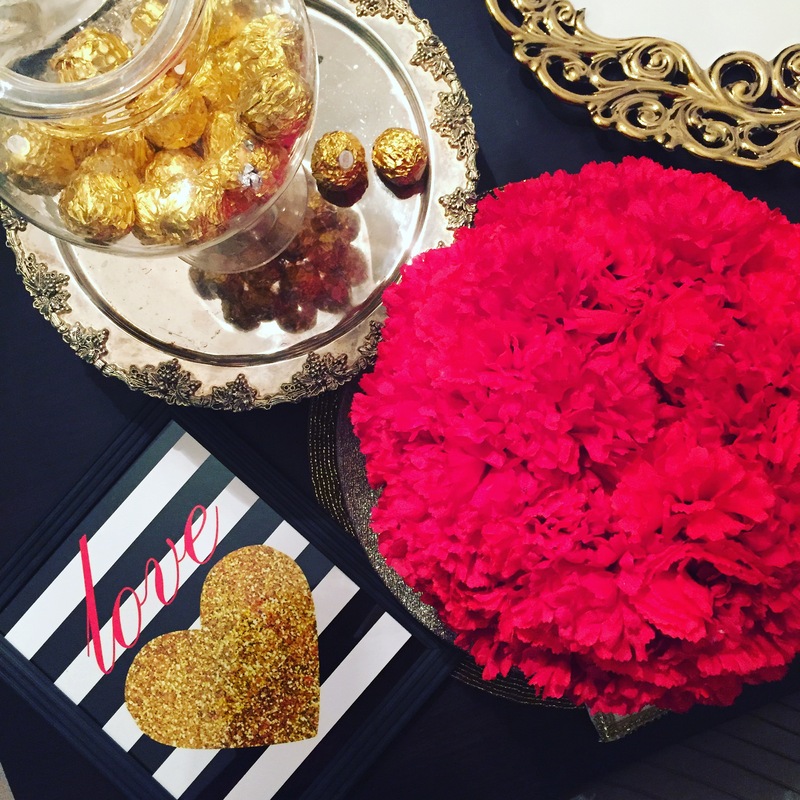 The Valentine’s Day photo shoot started in my kitchen. 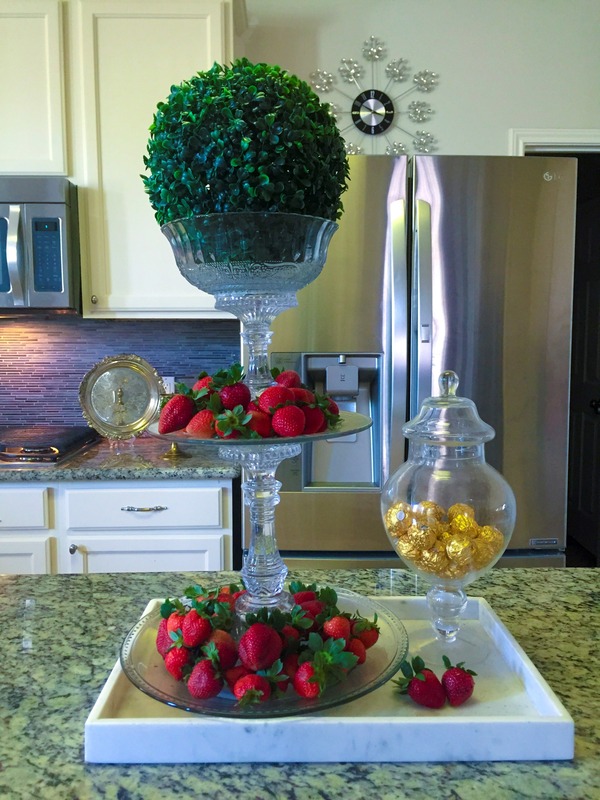 This setup includes a marble tray with goodies and a 3 tiered glass stand. In the background you see a floral ball which will be discussed later on a gold candle stick from the Goodwill last year. Here’s an up-close of the items corralled on the marble tray above. 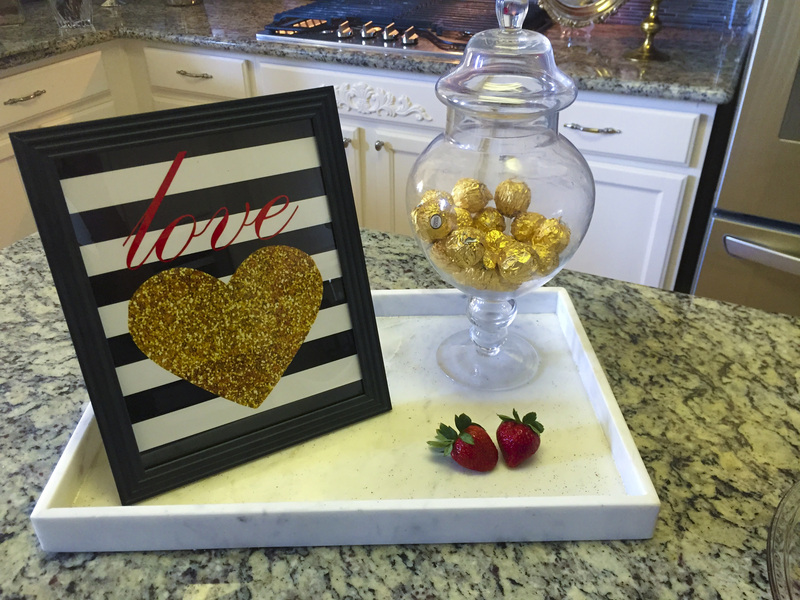 You have a framed art printable, an apothecary jar filled with candy, and a few strawberries. I spent $1 on the picture frame from Dollar Tree and $3 to print the photo. I am giving this printable away for free. See download details at the end of the post. 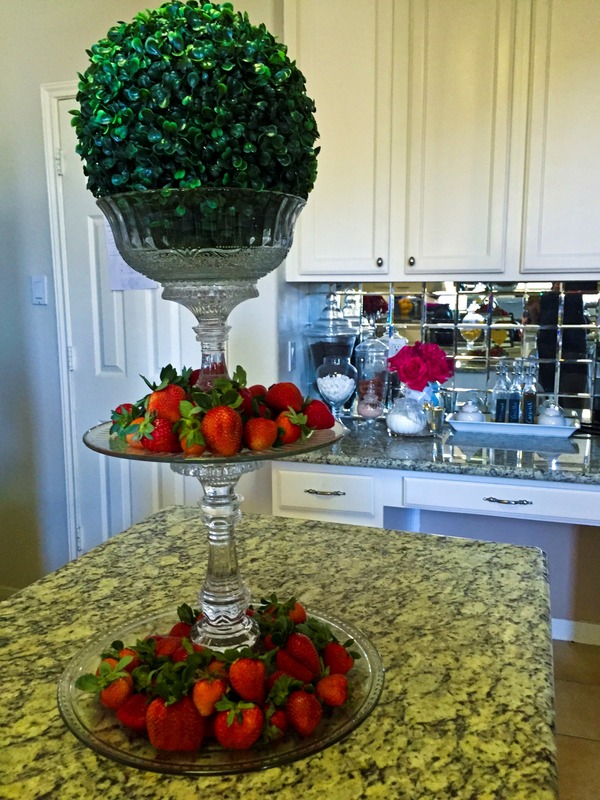 And here’s 3 tiered glass stand filled with strawberries and topped with a faux green floral ball. This stand is was created by me. Yes!! A DIY!! If you guys want it, I will do a post on how I created it. It was really easy. Again you see I’m using the marble tray. This time I’ve placed the glass stand inside. In case you were wondering, I purchased the tray, green floral ball, and apothecary jar from HomeGoods about a year ago. I think this was my favorite setting. Here, I used the same items as before but I added this red floral ball. This is a DIY from a 4th of July project I did. I so excited that I was able to pull it out and re-use it. If you want to know how I made this, check out the details at the end of this post. The silver stand that the ball sits on came from the Goodwill last year. So onto a different room. This time I’m in my family room and I brought a few items with me. 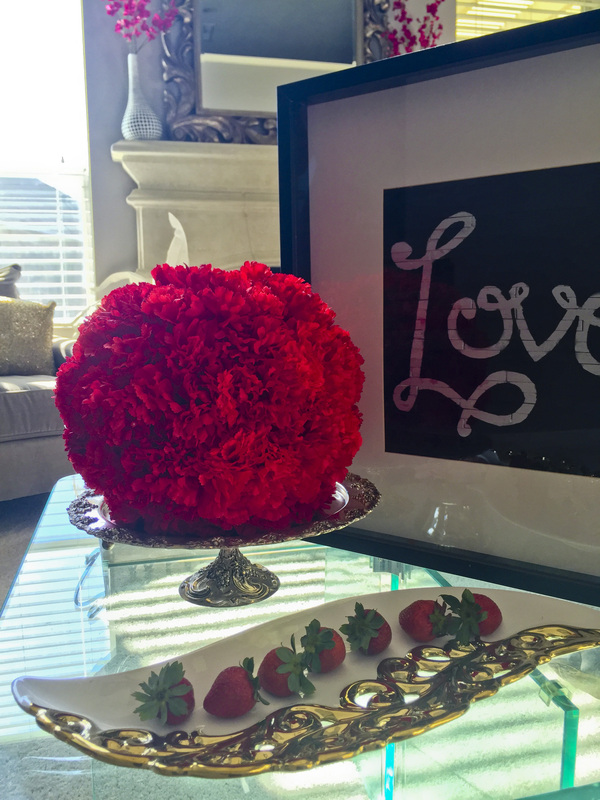 Again I’m using the the silver tray and red floral ball together with a white and gold platter purchased from HomeGoods last year, strawberries, and this Love artwork. Here’s a better view of the Love artwork. 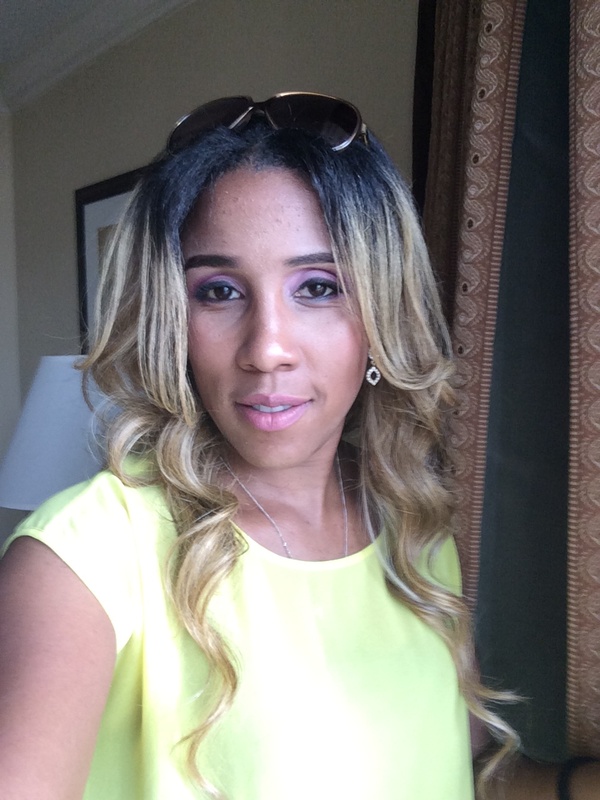 This is a DIY created by me as part a upcycle/dollar tree challenge. Want to know how I created this, look for details at the end of this post. Here’s another view but this time I’ve included a little green. This faux plant I purchased from HomeGoods last year. Still in my family room, I decided to switch it up a bit. 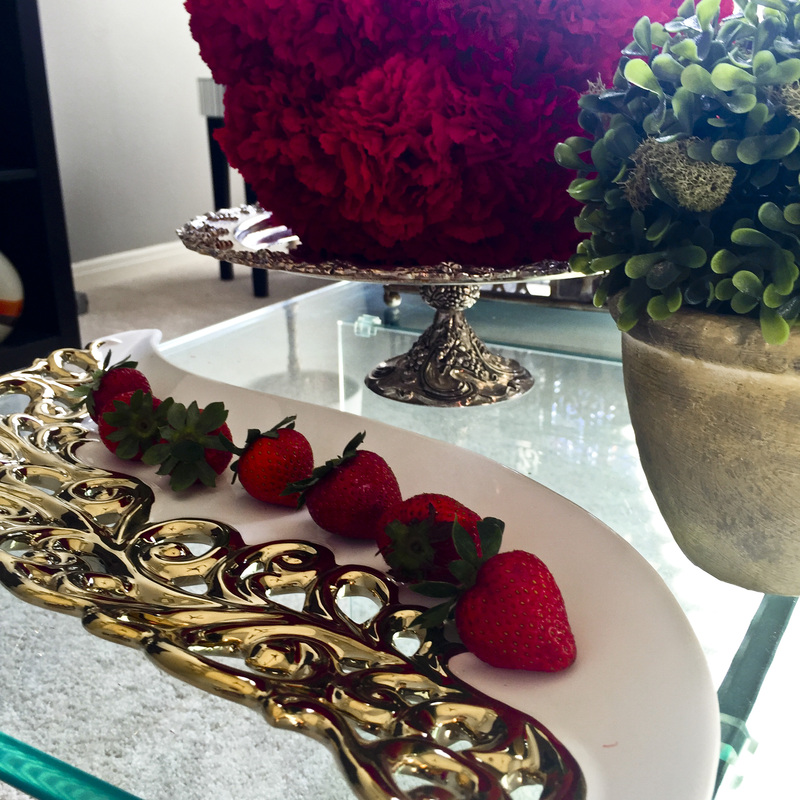 I’m using the floral ball on top of a brass candlestick purchased from Goodwill. 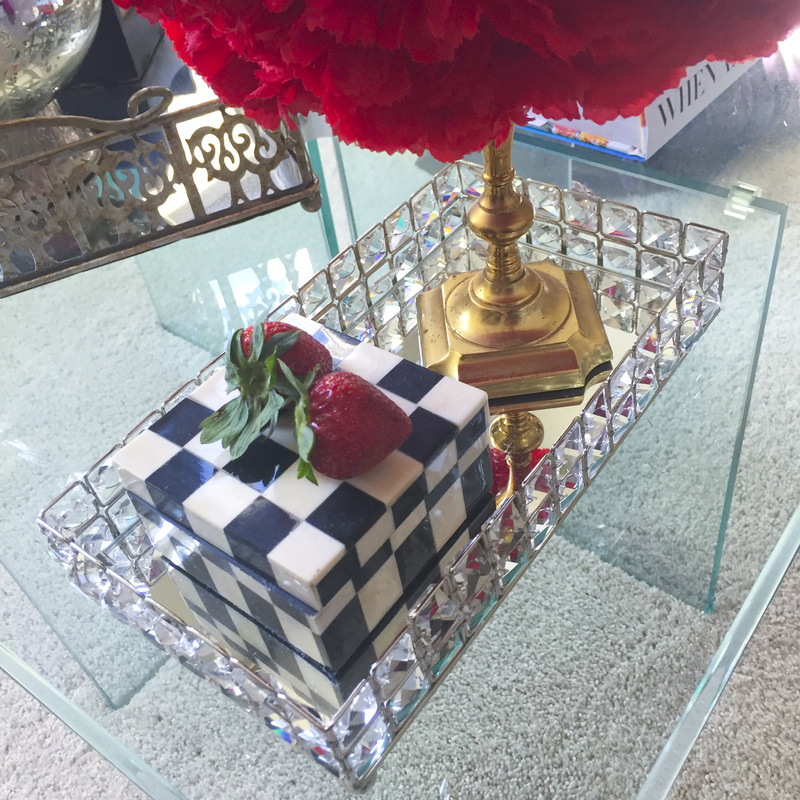 I also added in this black and white checked box and strawberries all corralled in this Bling Tray. 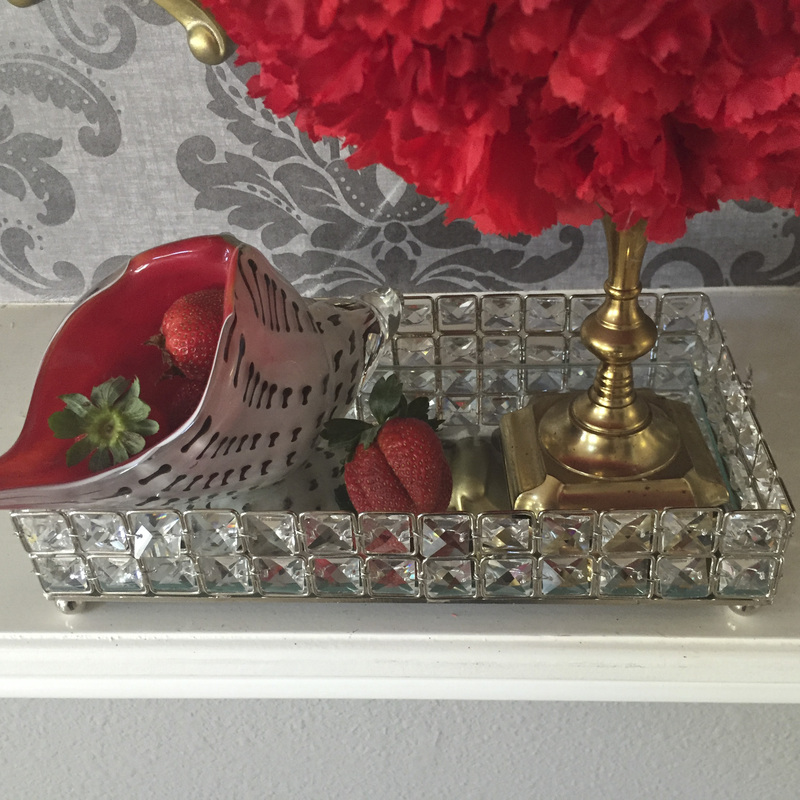 Both the check box and bling tray were purchased from HomeGoods a while ago. 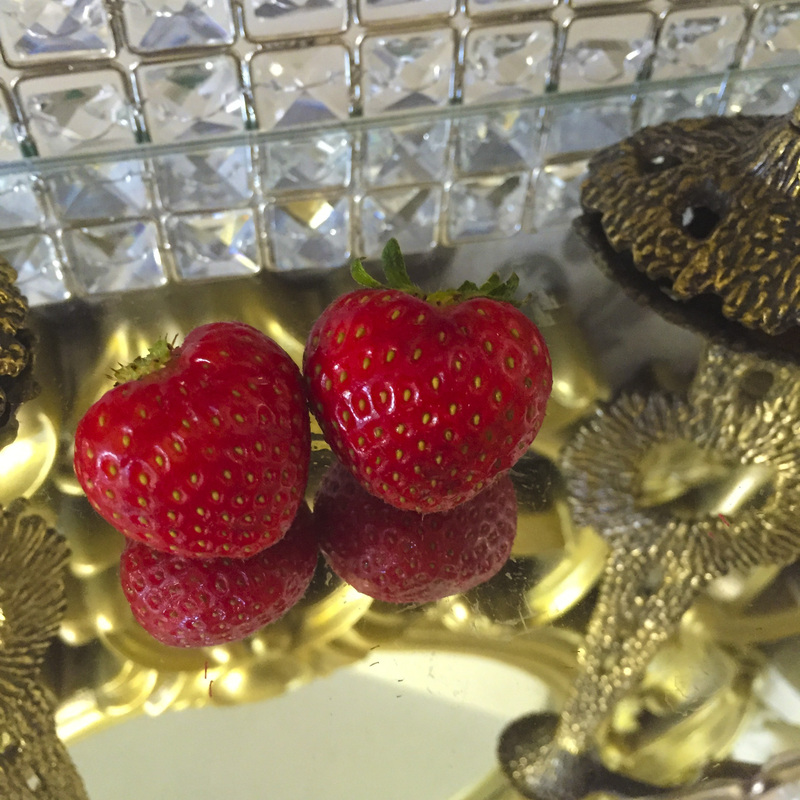 I found 2 strawberries that looked just like hearts. Of course I would included them. Aren’t they too cute? Ready for a new scene. I’ve moved to my niche in my entry way this time bringing the red floral ball, brass candlestick, and bling tray with me. Here I added a glass decorative sea shell piece that I found at Marshall’s maybe 5 years ago. Filled it with strawberries and voila! New scene, this time in my dining room! 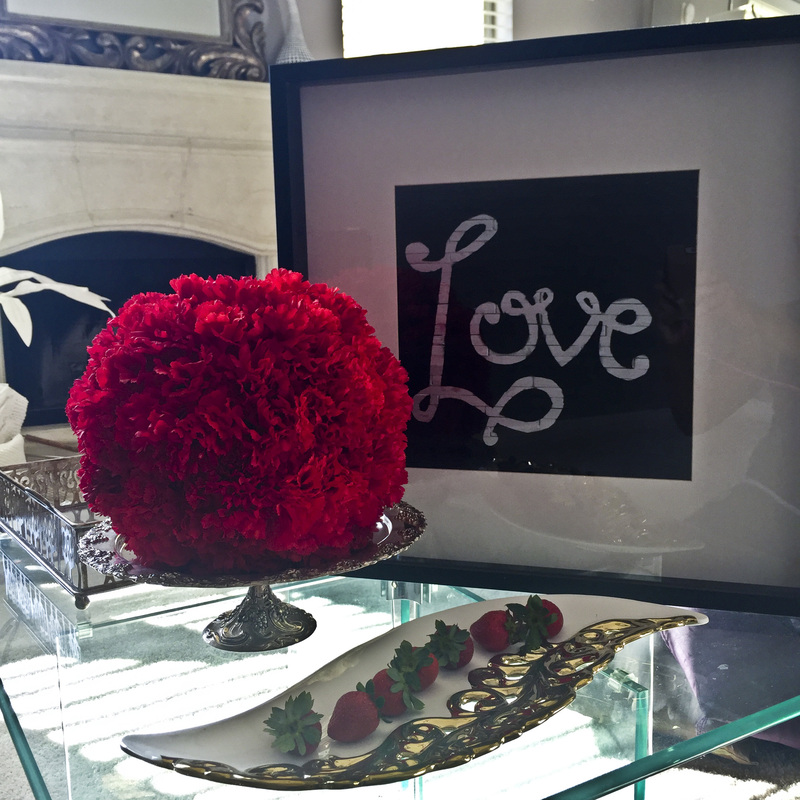 All of the items displayed here have been shown before but this time I decided to put the love artwork on the silver tray and leave the red floral ball on the candlestick. Be sure to check out the details at the end of this post to find out how to download this LOVE art printable for free. I’ve placed the love art work directly on the table and brought in the apothecary jar to sit on the silver plate for a different look with the same items. 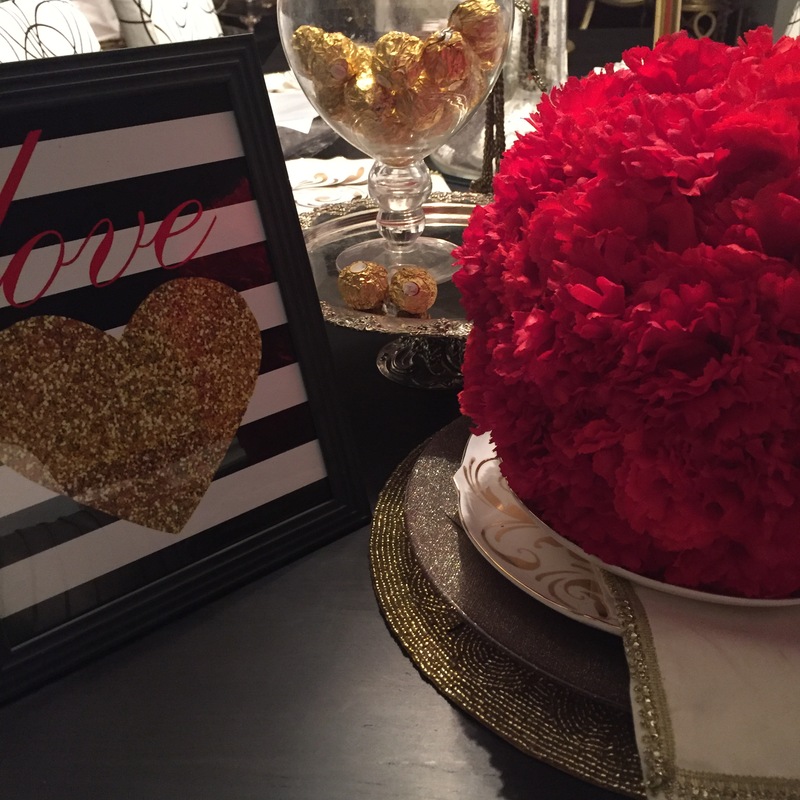 Also, the red floral ball has been moved to sit on top of my dining room place setting from Pier1. I hope this serves as inspiration and the encouragement to rediscover and re-purpose items in your home for any occasion. 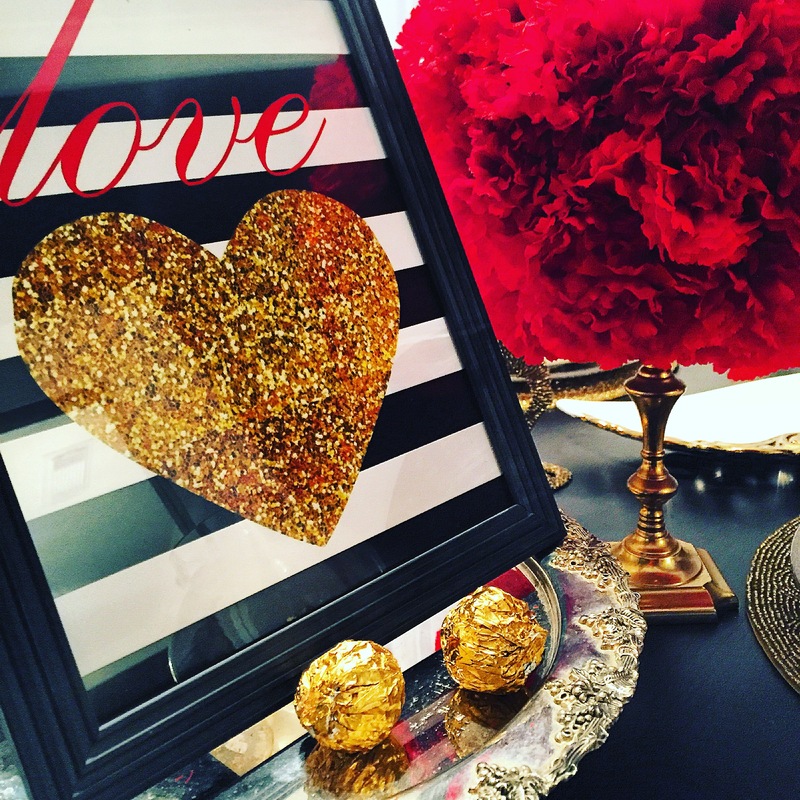 I want to know how you will re-use the items in your home for this Valentine’s Day. Leave me a comment below. Also, if you want more information on some of the items featured in this post, check under the “Blog Post Bonus” section below. I hope you all have wonderful week. Come back to see me soon. 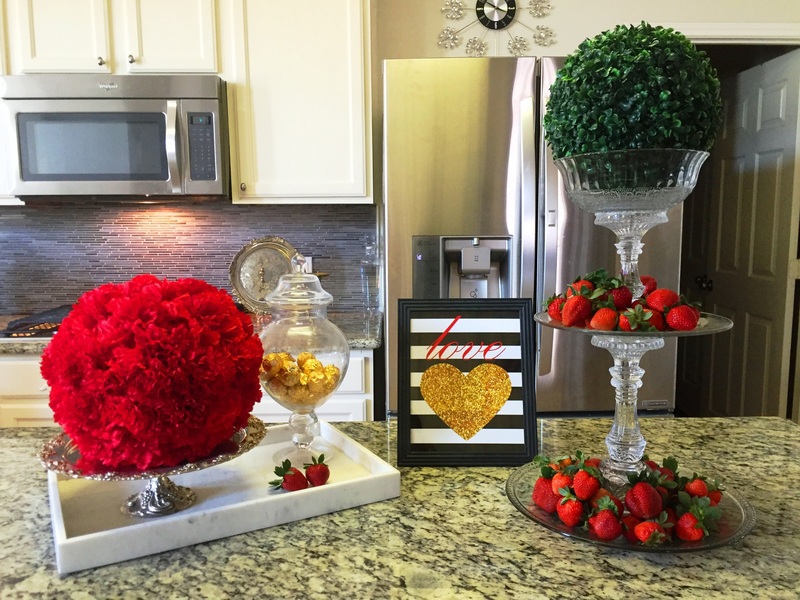 This video was created for the 4th of July and it will show you how I made the red floral ball. This video was created for a Dollar Tree / Up-cycle challenge and it will show you how I made the box frame art using an existing IKEA frame and popsicle sticks.